Rev. Janice Claypoole presently pastors the Ark of Mercy Church of God which she began in September of 1989 in Winchester, Kentucky. Before this time she was an evangelist and worked in prison and jail ministry. She is a licensed minister in the Church of God and was called into the ministry in 1978. 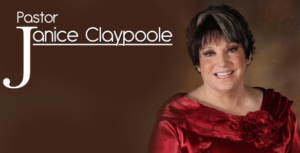 Sister Claypoole has an inner city ministry and numerous outreach programs, some of which include ministry to the nursing homes and Adopt-A-Block ministry teams. Prisons are covered statewide by jail and prison ministry workers. Our Daily Bread feeding program now serves over 254 meals daily, most of which are delivered to the homes of those in need as well as groceries Friday night Coffee House ministry includes preaching, singing and serving hot meals to those in need by our street witnessing teams. Meals are also served to children from the bus ministry and our youth every Thursday night and the children again on Sunday morning. Janice is married to Billy Claypoole and has two children, Bill Claypoole, II, and Francie Keathley, who are both in full-time ministry.